In 2018 consumer durables retail sales were affected by lower household consumption, together with the negative impact of the so-called ‘yellow vests protests’ at the end of the year, usually a peak sales period for retail. Purchasing behaviour has changed in recent years, e.g. the evolution of ‘Black Friday’ in France has changed sales patterns. According to the research institute GfK, consumer electronics sales decreased 0.3% in 2018, to EUR 4.3 billion. The stagnation was mainly due to declines in the struggling photo segment (down 14%) and lower sales of audio items. The consumer electronics segment is characterised by very low margins. Sales of home equipment decreased 0.6% in 2018, to EUR 31.5 billion, after a robust increase seen in 2017. According to Gifam (the French association of household appliances manufacturers) sales of large household appliances decreased 0.9% in 2018, to EUR 5.2 billion, impacted by a downward trend in new housing and lower household confidence. Sales of small home appliances continued its upward trend for the eleventh consecutive year, but at a lower pace (up 0.5%), due to a lack of innovative new products. After three consecutive years of growth, furniture sales decreased 2.7% to EUR 9.5 billion, mainly due to a subdued performance in H2 of 2018, according to the industry research organization IPEA. 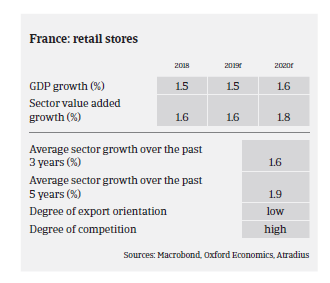 Some large retailers are facing difficulties, and it seems that businesses have adjust their product mix and reduce store sizes to adapt to changing consumption habits. That said, despite a decline in new housing, the kitchen segment (which accounts for 27% of furniture sales) kept up well, mainly benefiting kitchen specialist retailers. 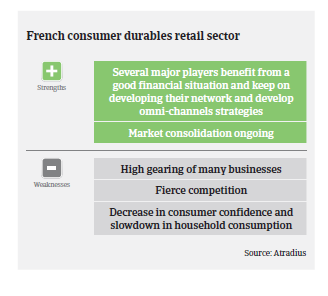 The French consumer durables market is not expected to rebound in 2019, due to the more difficult economic environment and ongoing social tensions. The decrease in new housing should again affect demand for large household appliances and furniture. The rather cyclical TV market is unlikely to be boosted by a major sports event as seen in 2018. The business environment will remain highly competitive in all segments. Increasing market share of online retailers has generated significant pressure on sales prices and profitability, especially affecting independent and local retailers. According to the e-commerce federation FEVAD, online retail sales increased more than 13% in 2018, and online sales accounted for 23% of home equipment sales. E-commerce competition and the high frequency of discount sales have squeezed the margins of retailers over the past 12 months. A concentration process through acquisitions or purchasing alliances is ongoing among retailers to cope with the mounting challenges. In order to adapt to the competitive environment and ongoing development of e-commerce, several major players have developed omni-channel strategies. Partnerships between online and brick-and-mortar retailers have emerged to take advantage of each other’s strengths. 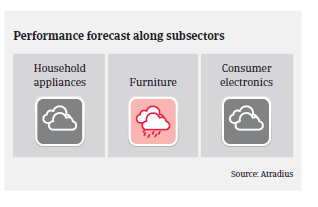 In general, the gearing of consumer durables retailers is rather high, given their need to finance working capital requirements and inventories. Moreover, there are peak seasons and special events which temporarily require additional financing. Loans are also required to finance the opening of new stores in order to extend geographical presence. Banks are principally not restrictive to lending to the sector, but their willingness mainly depends on individual retailers´ creditworthiness. Payments in the industry take 45 days on average. 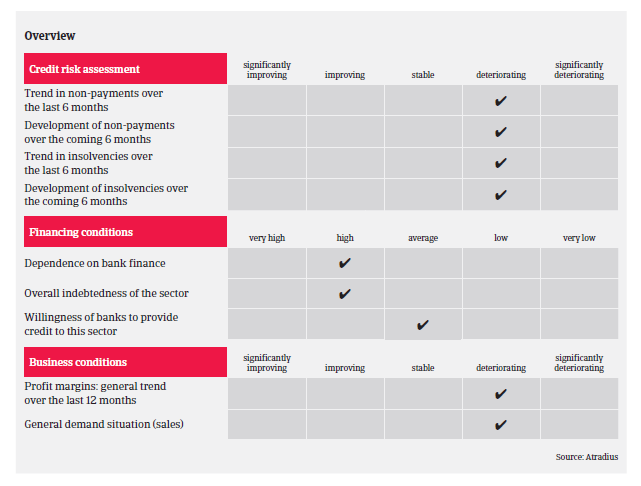 In line with the subdued sales performance in 2018 and rising market challenges, non-payment notifications and insolvencies increased in H2 of 2018, and are expected rise further in the coming months. Given the fierce competitive environment and pressure from online retailers, mainly independent and smaller players are threatened by business failures. However, some larger businesses are also facing major financial difficulties. Our underwriting stance for the consumer durables retail sector is neutral for the consumer electronics and household appliances segments. We remain cautious with small independent players, as deteriorating revenues and margins have affected several of them over the past couple of years. However, even larger businesses could face troubles due to increased financial exposure after acquisitions and the difficult economic environment. We are more cautious in the furniture retail segment, as the market situation of many small players is difficult due to the overwhelming market power of three large retailers. In general, we focus on the resilience of individual buyers in a competitive market environment, the distribution channels and the management of working capital requirements. The payment duration in the industry has increased to 70 days on average, and the payment experience over the past two years has been rather bad. Many food producers and processors struggle to pass on higher input prices, which is hampered by the high concentration and market power of retailers.